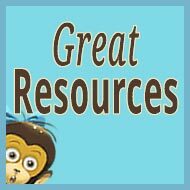 Although I regularly receive requests to review bilingual picture books, I’m generally unable to do much more than offer loud shout-outs on my Facebook page or through Twitter (which I’m always happy to do). 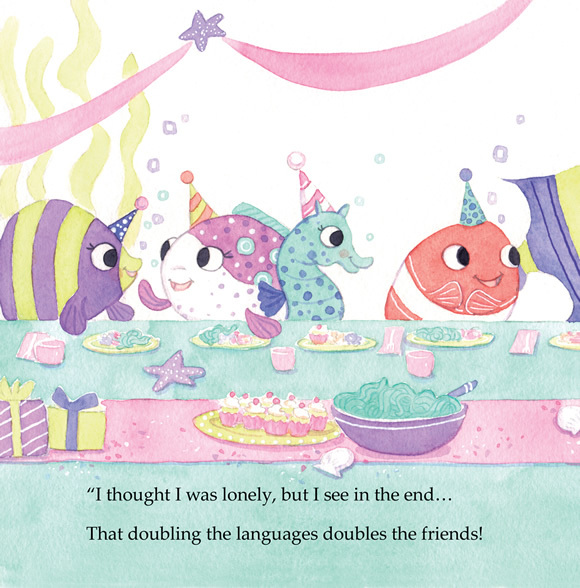 The reason is, bilingual picture books are typically written for an audience of two specific languages…and the readership of this blog is much broader than that. 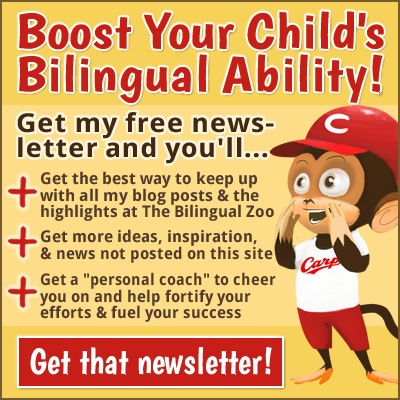 Naturally enough, my aim is to produce posts that will be of interest to as many parents as possible, whatever their languages or circumstances. 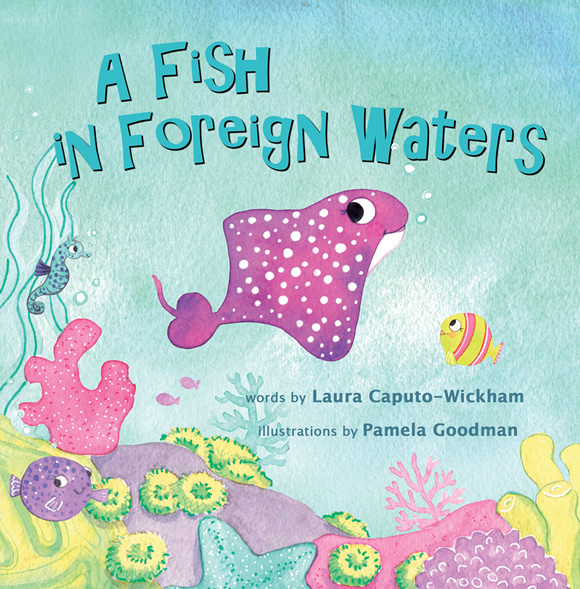 However, when Laura Caputo-Wickham contacted me about her new picture book, A Fish in Foreign Waters, I quickly saw that this book is different: it’s “bilingual” in a different sense. 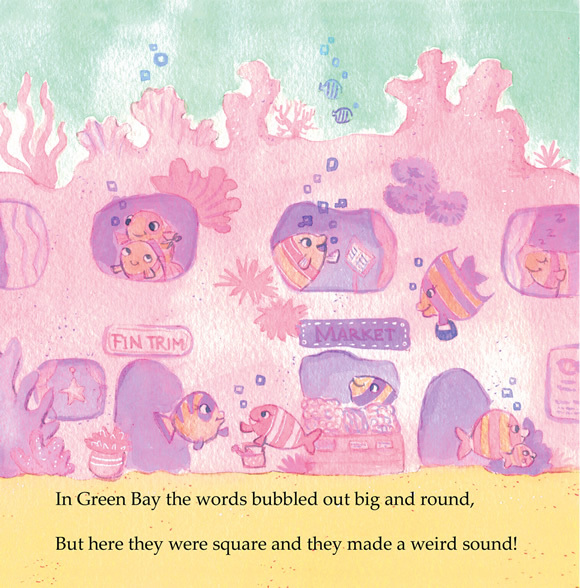 Written in English, the book shares the simple story of a fish named Rosie Ray who moves with her family from one part of the ocean to another and faces a new culture and language. Despite some initial difficulties, which prompt worries about being different, in the end she comes to see the deeper value of having a second language. Published in paperback by Long Bridge Publishing, see this page at their website for more information on the book and where you can order it online. 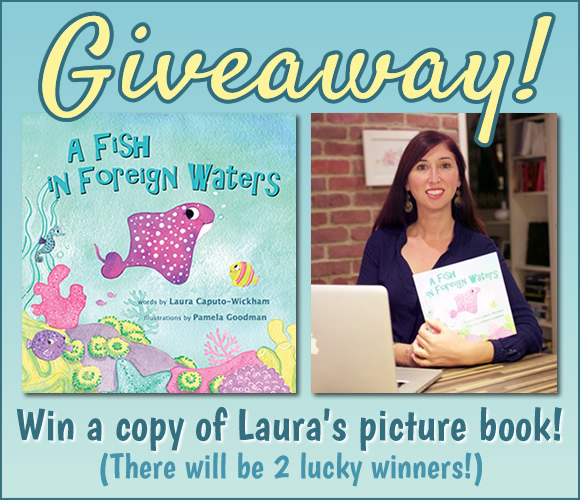 You can also win a free copy, signed by Laura for your kids, by entering this special giveaway at Bilingual Monkeys! Congratulations to you both! And a big thank you to everyone who entered. 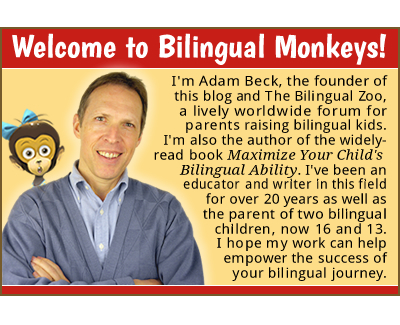 Laura and I wish all of you much success on your bilingual journey! 3. All entries must be submitted by the morning of Saturday, November 21 (Japan time). On that day, the comments will be printed out and cut apart to serve as entry slips for the drawing. The slips will be placed in a big, empty fishbowl and my daughter and son will each select one winner at random. 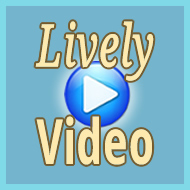 I’ll then contact the lucky winners by email and update this post with the results. I may not respond to these comments, but Laura and I look forward to seeing them. Thank you for entering the giveaway, and for sharing this information about Laura’s book with others! 4. 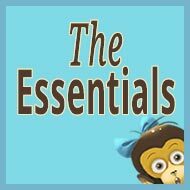 We try to make language fun and exciting and do not force perfect grammar from the get go. We say silly things in many languages and play with words. 4. When we are in the minority language country, I try to give my daughter many different interesting experiences: meeting ml kids her age, making new discoveries, visiting museums and other cool places, doing things we don’t or can’t do at home in the ML country. 4. We play as much as possible in our minority language (English) and try to make it part of our daily life. This is another opportunity to have quality time with my kids and to learn/teach from each other. 4. We sing, read, play, make up stories, and Skype with our family in California. My son just started saying “up” and it’s so sweet to hear his little voice. 4. We read a lot, a lot, a lot. 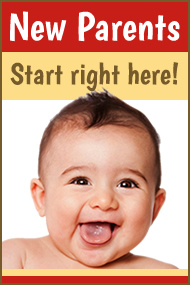 And we’re going to a French-speaking playgroup, as well as organizing English-speaking playdates. 4. 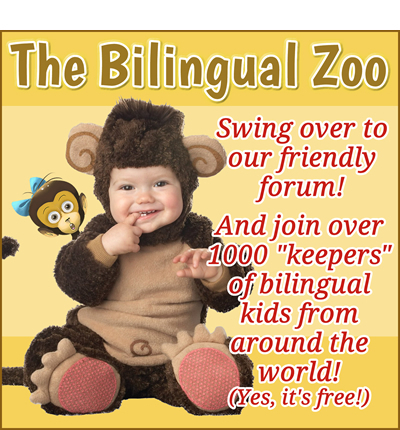 We meet with an English speaking playgroup every month for our son to make friends with other bilingual kids. 4. We read, at times we write, we make up rhymes, poems and stories; when we get the chance to do homework or study together, we introduce the subjects in our mother- (or father-) tongue. Trilingualism gets tougher with school, but challenges and satisfactions are also bigger! 4. 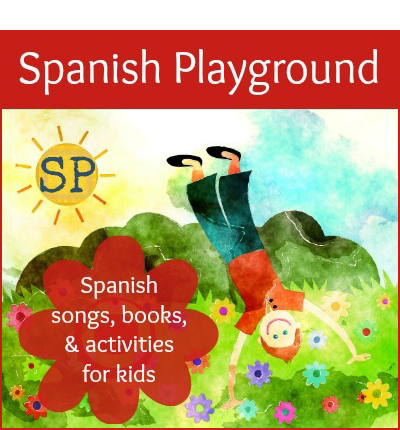 We have a reading challenge, 15 Books for 2015; we play games to use and combine languages (Bananagrams); we try to help others (cousins) who are learning English. 4. We listen to a lot of songs and read many stories in the minority language. We have magnetic letters on the refrigerator door that we love to spell out different words with. 2. Girl, not yet born. Due god-willing in January. 4. We plan to read a lot in English and only speak English in the home. I’m now looking into what I can do from the beginning to make sure that our daughter doesn’t abandon English like some of our friends’ kids have done. My own mother moved to America from Israel and my father from Russia and even though there was a possibility for three languages I had a very hard time learning Russian or Hebrew from them. 4. At the moment it’s about meeting other German speakers so she realises I’m not the only one speaking German. 4. I try to keep the minority language as a game and especially linked to her passion which is science and space! 4. I make an effort to celebrate Dutch holidays. At the moment the kids are already starting to get excited about ‘Sinterklaas’, which is celebrated in December. 4) I’m trying to provide plenty of opportunities for my daughter to play with Polish speaking children, help her build a stronger relationship with grandfolks in Poland by talking to them via Skype and holiday visits as well as trying to match her experiences in the majority language with those in the minority language (e.g. a trip to the theatre or a hair cut needs to be experienced in both countries). 4. I always talk in the minority language when we are talking about their favourite things and encourage them to talk about them in that language too. 4. We just stick to our own languages ALL the time when talking to our daughter (with the exception of some books or songs) and we do skype a lot with grandparents…for now it works great! 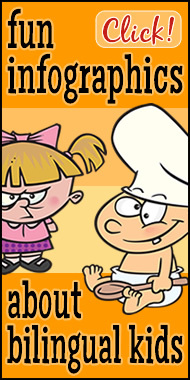 English is for school only and Italian…is all around! Gabriela, from Buenos Aires, Argentina. We write letters regularly with our friends in Holland and the United States, and those letter are always in English (our L2). 4. 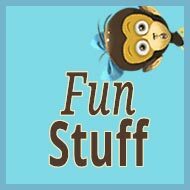 I try to make learning new words in Spanish fun for my girls – we sing songs, read books, and act things out when we are learning! 4. We read at least one book each day and he listens to only English songs in the bedroom and living/dining room. 4. Singing songs! Even his monolingual friends love learning our many fun songs. 4. Grew up with English at school, Spanish in the street, and Korean at home. Would love for my girls to be able to be comfortable with Spanish so that they can travel and navigate on their own someday. 1. Luzy in West Virginia, U.S.A.
4. I talk to my daughter only in Spanish at home and she learns English at day care. It is very important to me that she knows her culture and traditions. 4. I communicate words with physical actions to her. For instance, when I’m going to pick her up I spread my arms and say “vente,” or when I put her in her car seat I say “vamonos.” I also expose her to lots and lots of Spanish music; she loves it! 4. We encourage students of different languages to support the language development of their peers. English is our minority language (my classroom has 3 native English speakers), but our students receive instruction and hear stories in both English and Spanish, so our English speakers often have the opportunity to help teach and support their peers. 4) To promote a positive attitude about my students’ languages, I have books in both languages in my classroom library. I alternate the languages of the texts we read for shared reading and read alouds. I also also alternate the language of the writing piece so students create a piece in both languages for each type of writing we study. 4. I very frequently praise my son (in English) when he uses our minority language (English) to speak to me. 4. 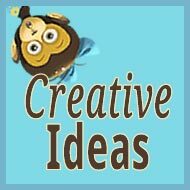 We attend an English playgroup, we sing songs, we have many English books at home and usually read them at bedtime, we’re also trying to establish a pattern for “English only” moments (i.e. in the car…); we skype with our (English speaking) relatives in South Africa who came here after a long time last summer. We seized the moment to get back in touch with them since then! 4. I always speak in Italian to her, we sing songs and we have a few books. I would like my daughter to be multilingual so she is culturally sensitive and feels at ease in any society in the world as I find it makes an extremely rich life. I only speak English to her and increase her English input as much as possible via other resources like speaking toys for example. And commenting everything I do in the minority language when she is around. 4. 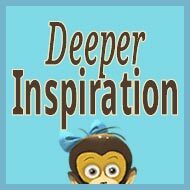 I try to show my child that because he knows another language, he can help his friends or others to use it as well. That will make him feel happy about it and will make his friends happy too.